In April this year, a team of economists from the World Bank released a report on the labour force participation of women in India. Using data from the National Sample Survey Office (NSSO), this report shows that labour force participation rate of women in India has slipped dramatically in the last 20 years. The drop has been most dramatic among women in rural India—research by the authors shows that while nearly half the rural women aged 15 years and above were “in the labour force" in 1993-94, the number dropped to less than 36% in 2011-12. Labour force participation rate of urban women has also dropped in the same period, though not as dramatically. Data from the censuses of 2001 and 2011, while obviously not coinciding with this research, confirm that there has been a drop in labour force participation. 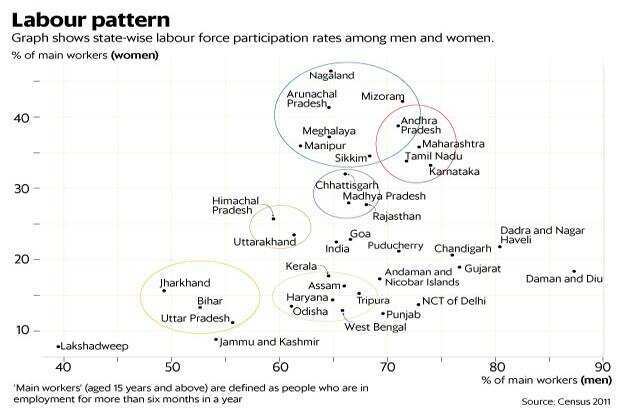 The absolute numbers apart, what is interesting is the pattern in state-wise labour force participation rates among men and women, according to the 2011 Census. The census defines “main workers" as people who are in employment for more than six months in a year. If we look at the state-wise proportion of “main workers" among men and women, states cluster themselves in a rather interesting manner, as seen in the chart. Neighbouring states are typically close to each other in terms of both male and female labour force participation, though what is interesting are states that are not close to each other. For example, Maharashtra, Karnataka, Tamil Nadu and Andhra Pradesh fall into one neat cluster, while Gujarat and Kerala, which are states neighbouring this geographical cluster and which are normally considered to be similar to these states lie rather far away. Essentially, both Gujarat and Kerala have a much lower employment rate among women than these four states. Kerala, interestingly, falls right in the middle of a cluster of eastern states such as West Bengal, Tripura and Assam. The other states in the North-East on the other hand are in a cluster with much higher female employment. Elsewhere, the so-called BIMARU states show up as not one, but at least two distinct clusters. Madhya Pradesh, Chhattisgarh and Rajasthan have reasonably high employment rates for both men and women, while Bihar, Jharkhand and Uttar Pradesh fare poorly on both counts. Uttarakhand is in its own cluster along with neighbouring Himachal Pradesh. Northern states such as Punjab, Haryana and Delhi don’t fall into any such neat geographical cluster but are characterized by low female employment. Finally, if we have to pick one state that is representative of the country in terms of male and female employment rates, it has to be Goa, as the figure shows. It must be mentioned here that what we have noticed is an interesting pattern, and while we can hypothesise why states fall where they do on this map, it may not be easy to come up with strong causality.